The MBDCA is sadly dissolving after 40 years of serving the mixed-breed community, but the St. Louis Chapter will continue on. Members may transfer their membership (keeping existing legs and titles) to the St Louis chapter to continue working on MBDCA titles. Please visit mixedbreeddogclub.com for more information. The Mixed Breed Dog Clubs of America (MBDCA) was founded in 1978 by Nancy Gilbert. A few members of the Washington Mixed Breed Dog Club were aware of an interest in other parts of the country in a formal Mixed Breed obedience program such as the one operating in Washington. MBDCA was formed to meet this need, and obedience regulations were adapted to meet the needs of the Mixed Breed Dogs (based on AKC Regulations), and the club began to advertise in national magazines. The MBDCA founders believed in population control for Mixed Breed Dogs, so all dogs registered with MBDCA must be spayed or neutered. We also have a Code of Ethics which must be agreed to by all members. The Washington Mixed Breed Dog Club became the first Chapter of MBDCA. Others have since followed: The Mixed Breed Dog Club of California, the Mixed Breed Dog Club of St. Louis (Missouri), and the Mixed Breed Dog Club of Oregon. Many members, however, prefer not to form a Chapter in their own area. And so, there are Individual members scattered all over the country. In areas where there is no chapter to hold matches, these members attend matches given by other breed or 4-H clubs. The best way to find out about matches is through local obedience schools or trainers. 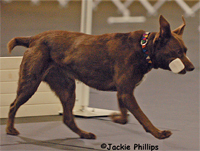 Mixed Breeds may earn legs on obedience titles in classes where there is a judge approved by MBDCA. Mixed Breed Conformation has a detailed standard and point system. Because we stress obedience and companionship, we are the only dog organization in America that requires a conformation dog to obtain an obedience degree before he/she finishes a Championship. MBDCA qualifies their own judges. Our judges must have had experience judging, training, and showing dogs in order to qualify. So while our members get their legs at matches, the level of judging is good, and they may have more distractions than a dog entered in an AKC trial is likely to have. MBDCA does not have a variety of activities - that is left up to the local Chapters according to their interests. MBDCA is a dog registry and record-keeping organization, as well as a national policy maker. The one event that MBDCA does sponsor, however, is the National Specialty. This show, for registered Mixed Breeds only, is usually held in the Fall. The first two Nationals were held in the Seattle area. But now, with interest rapidly growing nationwide, the Chapters host the National and it moves around the country.